Runners get the chance to run the challenging hills and trails of a piece of Hollywood history at the Griffith Park Trail Half Marathon, which takes runners on an out-and-back course through this park in the middle of one of the nation’s largest urban areas that’s played a role in countless movies and television shows, from the 1955 James Dean classic Rebel Without a Cause to shows like 24 and Alias. It’s also the home of the world-famous Hollywood sign that looks out from the mountains above Los Angeles onto the studios and Sunset Strip below, and runners will get a close-up view of that plus the Bronson caves and more. As in its first year, runners will start the out-and-back course for the race on Commonwealth Canyon Drive near the southern end of the park, overlooking the Roosevelt Golf Course and downtown L.A. to the south. From there, the race heads into the hills, starting a route that features three out-and-back stretches that lead out to three different turnaround points, so runners can expect to see their fellow participants coming and going along different stretches of the race. Along the way, the terrain is “tough and rugged,” according to the race organizers, as it unfolds along several trails within the park, with names like the Aberdeen, Hogback, Brush Canyon and Hollywood trails. There will be fully stocked aid stations at the mile 2.3/8.2 point of the race, as well as at the second and third of the three turnaround points out on the course (at the 6.1-mile and 10.38-mile turnaround points, respectively). That effectively works out to four aid station points during the 13.1-mile race, as runners will pass the first aid station a second time on the way back in during the race’s second half. Runners will have 5 hours to complete the half marathon and will start in waves, though runners will all need to be at the starting line by the time the race gets going. As the race organizers note, runners who arrive after the last wave has left the starting line will not be able to participate in the race. There will be no age group awards, but awards will be presented to the top 3 men and women overall in the race. Like the Leona Valley Trail Half Marathon that takes place each October, the Griffith Park Trail Half Marathon is organized by Keira Henninger, one of the running world’s most accomplished ultra-marathon runners who also works as a race director for events like October’s Los Pinos 50K trail race in California’s Saddleback Mountains. Nestled in the hills just north of downtown Los Angeles and south of Burbank in Southern California, Griffith Park typically sees November temperatures that average between 53°F and 73°F, while rainfall totals average just over one inch for the month. On race day (Nov. 10), the average low is 54ºF and the average high is 74ºF. See the race route map for the Griffith Park Trail Half Marathon here. To reserve your spot in the 2018 running of the Griffith Park Trail Half Marathon, register online at UltraSignup.com here. 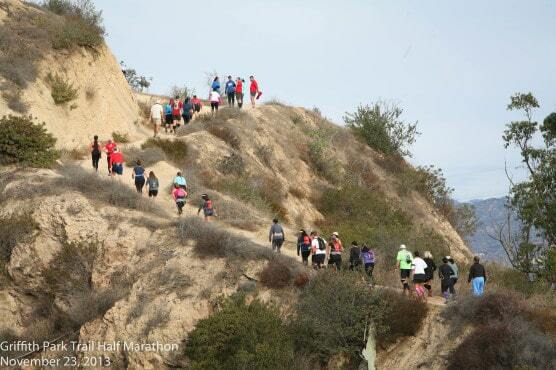 Ever run in the Griffith Park Trail Half Marathon? Share your impressions here, or post your review in the Comments below.